Concluding a college journey that began in 1990, interRel CEO and cofounder Edward Roske earned his Bachelor of Arts in Liberal Studies from Shimer College on April 30, 2016. Roske left Shimer more than two decades ago to pursue his entrepreneurial vision and cofounded interRel in 1997. 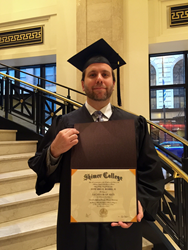 Concluding a college journey that began in 1990, interRel CEO and cofounder Edward Roske earned his Bachelor of Arts in Liberal Studies from Shimer College on April 30, 2016. Roske left Shimer more than two decades ago to pursue his entrepreneurial vision and cofounded interRel in 1997. Roske has spent 25 years building a company with a distinct reputation for excellence and education in the Enterprise Performance Management (EPM) and Business Intelligence (BI) industry. Edward himself is an Oracle ACE Director, award winning speaker, and co-author of the “Look Smarter Than You Are” book series. As CEO of interRel, Roske has created a company culture passionate about education. Edward personally charges each employee with the directive to “learn something and pass it on.” The company provides opportunities for all employees to speak publicly, teach, write blogs, contribute to books, and create videos for the company’s free-access video education platform, Play It Forward. Through these channels, interRel educates technology users, business administrators, executive decision makers, and even competitors. Roske decided to complete his degree about two years ago when he was inducted into Shimer’s Board of Trustees and appointed as Head of the Admissions Committee. That same year, Shimer was named the “Worst Place to Study in America,” according to a ranking by the Washington Monthly. After the standings were released, Jon Ronson of The Guardian determined that while Shimer may be the worst traditional college in America, it may also be the future of education. Inspired by his reconnection to his alma mater and the public debate about its education philosophy, Edward embarked on a plan to graduate. In addition to taking courses in subjects like game theory, Roske wrote his senior thesis on Eddie and the Consultants: A System 9 Musical, a 2007 musical in which Roske wrote and costarred. Achieving his degree at this stage in his career is a testament to Roske’s long-term commitment to education. “Even though it took me 26 years, I wanted to complete my degree not because anyone ever asks to see my diploma, but because it’s important to finish what you’ve started. Sometimes you have to do something not because it’s easy, but because it’s hard,” Edward explains, paraphrasing JFK. Shimer College is a small, private, liberal arts college located a few miles from downtown Chicago, Illinois. It was founded in 1853 by Frances Wood Shimer and Cinderella Gregory. Shimer has no more than 12 students per class in order to focus on discussion, not lecturing. Shimer believes in reading original works instead of textbook summaries of the great ideas from classical literature. Founded in 1997, interRel Consulting is the longest-standing Hyperion partner dedicated solely to implementing Oracle EPM/BI solutions for Fortune 500 and mid-size companies, and is the only three-time winner of Oracle’s Specialized Partner of the Year for BI and EPM. The company is an eight-time Inc. 5000 honoree committed to education with a platform that includes 10+ books in its best-selling technical reference series, “Look Smarter Than You Are with Hyperion,” free,twice-weekly webcasts, the free-access video education platform, Play it Forward, on YouTube, and multi-track Oracle EPM/BI Solutions Conferences across the U.S. and Canada. Home to three Oracle ACE Directors and three Oracle ACE Associates, interRel frequently participates in Oracle Technology Network international tours in developing markets. To learn more about interRel Consulting, please visit http://www.interRel.com.